Bhilawan Nut Shell Liquid (Bnsl) Is Obtained From The Pericarp Of The Bhilaean Nut Which Is popularly Known As Marking Nut, Which Is Similar In Taste And Nutrition To Cashew Kernel. Bhilawa or Marking Nut is used in medical precautions and its most useful part is its kernel, which is known as Godambi and used as dry fruit. It is also known as marking nut. It is species of Kaju. 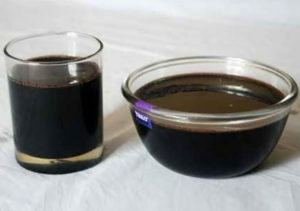 Bnsl Is Black Corrosive Vesiccant Liquid Which Causes Painful Blisters On The Skin. It Contains About 46% Of A Catechol Derivative, Bhilawanol Having Long Unsaturated Carbon Side Chain (C15H27). The Rest Of The Liquid Is Mostly A Tarry Material Composed Of High Boiling Phenols And Hydrocarbons. On Hydrogenation Of Bnsl(B.P.213-214), Hydro-Bhilawanol Is Abtained In The From Of Silky – Needles Having M.P. 57-58.The Recent Study By Rrl ,Hyderabad,On The Constitutional Make Up Of Bnsl By Nmr Technique Showed That The Diene Concentration Of Bhilawanol Is About 70 Percent. Medically It Is Used In Rheumatism, Leprosy, Eczema, And Other Skin Diseases, And Industrially It Is Used For Coating Of Baskets, Boat Planks And Other Wood Work As Preservative And Water Proofing Material. AKSHAY CHEMICALS IS MANUFACTURER OF GEN II @ III CASTOR OIL DERIVATIVES . Castor Oil is a biodegradable and renewable resource for a large range of raw materials.